I wanted to mention that I have finally gotten around to deciding on a name for my head-stand worm carp fly. Typing out head-stand worm or just calling it "the worm" for short was getting old. If anybody cares, henceforth it will be dubbed "Trouser Worm". It is kinda crass but has been stuck in my head so long that nothing else would do. If you want to go calling it "McTage's Wee Little Trouser Worm" that is fine too, I am secure in my manhood. ﻿﻿﻿﻿Secondly, being relatively new to things I had no idea that you could so easily improve the color of digital pictures. I just figured out that the software I use (IrfanView) has something called "auto adjust colors". It is like black magic. You push that button and on every single picture the color is more vibrant and real. I have no idea how the software knows, it just knows, but expect my pictures to improve! Finally I put a new under-water fly video of a commercially tied Egan's Head-Stand on you-tube. The original head-stand has a much subtler action than the flies I have been working on recently and uses significantly less weight. 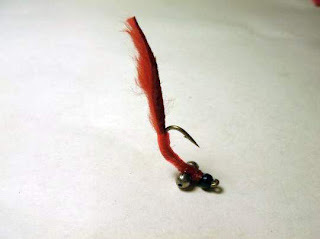 The lack of weight combined with a decent amount of drag means that this fly has a pretty slow drop which is a little limiting when I am fishing current. I usually only break it out when I really need less splash-down and a milder action. The Trouser worm most definitely out performs the head stand nymph in the water tank time trials. Will carp stew be making an entrance into this event sometime soon? Nice work man. What are you using for the tail? I will have to tie some up for a local lake where all they seem to want to eat is worms. Now that's a review. Nice. @N.Taylor: Not sure if it outperforms in the videos or not, just very different. Then again I have caught about 10 times more fish on the Trouser worm than on Egan's Headstand. Could just be the fish I am targeting though. And yes, I am slowly but surely going to film the carp stew and a bunch of other carp flies. The next one will be of the trouser worm tied in a range of weights. @Ryan: For the trouser worm I use either a rabbit strip with the hair buzz-cut or a tail made of foam plugs. I use the leather more than the foam though. @JGR - Thanks for the feedback. I like these videos allot because they give a better idea of how flies really behave. Yeah man, these vids are great McTage. Got me thinking about some different ways to strip and hop these flies in front of fish. Can't wait to hear how it goes, good luck in the Slam! Well TD, it went good. Really Really good actually!